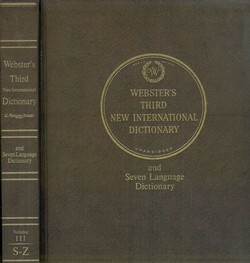 Webster’s Third New International Dictionary, first published in 1961, was among the most contentious reference books of its time. It signalled a clear editorial shift from its 1934 predecessor, most controversially in that it empirically described conventional English usage more than it prescribed ‘correct’ usage (as Webster’s Second had done). Where W2 had liberally applied labels like erroneous, incorrect, improper, vulgar, and ludicrous, W3 preferred to label words as substandard and nonstandard, and did so only infrequently. The response to its publication was mixed, to put it mildly. 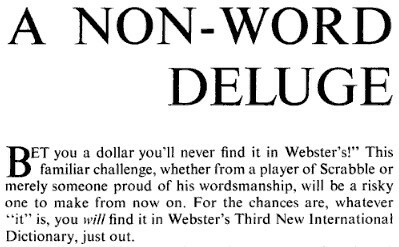 Some luminaries accused Webster’s of abandoning its authority; others denounced the book’s permissiveness (unlike W2, it included many taboo words; this remains a sticky subject). Wilson Follett described its makers as “patient and dedicated saboteurs”, declaring their work “a scandal and a disaster” and fulminating that it had “thrust upon us a dismaying assortment of the questionable, the perverse, the unworthy, and the downright outrageous”. Jacques Barzun said that he didn’t read it all, but that he laughed at least once on every page he read. So much for the sobriety of Merriam-Webster’s cardinal virtues of dictionary making: accuracy, clearness, and comprehensiveness. The New York Times advised its staff to keep referring to W2, feeling that its successor could “only accelerate the deterioration of the mother tongue”. The National Review found W3 “big, expensive and ugly” and said it had “only one standard – inclusiveness”. The Journal of the American Bar Association called it “a flagrant example of lexicographic irresponsibility”, while the Richmond News Leader said that no school or library was compelled to buy it,* and that “no English teacher need respect its corruptions” [via]. Dwight Macdonald, in an influential savaging in the New Yorker, called it a “massacre” and wondered “where completeness ends and madness begins”. He said it had “made a sop of the solid structure of English, and encouraged the language to eat up himself”. Solid structure? Himself?! At this point I need to remind myself that yes, he was writing about the English language. A few critics were less caustic and appreciated W3’s non-judgemental approach and modern linguistic sense. (Though they generally had reservations too.) Mario Pei noted its “many commendable features”, predicting that it would “enjoy a healthy life, even if not too prolonged”, while Robert Burchfield described it as “a bold landmark fashioned to meet the needs of the present”. Ethel Strainchamps praised the dictionary in a St. Louis Post-Dispatch review, then wrote a follow-up article that addressed the shortcomings of some of the criticism. She believed the attacks suggested a “cultural lag”, about which more below. For us to attempt to prescribe the language would be like Life reporting the news as its editors would prefer it to happen. You might also have noticed the subtle, unthinking sexism of Life’s rant, evident not only in its casual use of fishwife as a scornful symbol of someone with a poor standard of English, but also in its erroneous description of the language as “the King’s English”. Since Elizabeth was the reigning British monarch in 1961, “the Queen’s English” is the phrase that was needed. (I’ll ignore, for now, how problematic are both terms.) It’s a remarkable oversight, especially given that guidance on this matter is apparently included in both the second and third editions of Webster’s. I can only say that it’s nice to be informed and sigh to realize that I am becoming an old fogy. . . . In part, the trouble is due to the fact that there is no standard for standard. Ideas of what is proper to use in serious, dignified speech and writing are changing — and with breathtaking rapidity. This is one of the major facts of contemporary American English. but it is no more the dictionary’s business to oppose this process than to speed it up. Language changes all the time. As David Guralnik wrote: “Change, even change through error, has been a natural process in our language from its very beginnings, and nature is not to be denied.” Dictionaries can scarcely keep pace, but they can be commended for trying. W3 was a radical new edition also because it excised much of W2’s biographical, geographical, and other encyclopaedic material. Usage, too, has become more of a category in its own right. Some dictionaries append usage notes to disputed definitions, but if you want extended advice there are many dedicated usage dictionaries. Having a few of them at hand helps keep bias at bay, and notions of correctness and acceptability in their place: forever open to revision. * Speaking of which, G. & C. Merriam, now Merriam-Webster, were subject to a takeover attempt by the American Heritage Company, who were appalled by W3 and later published a dictionary of their own (which, for what it’s worth, I keep by my desk and refer to regularly). This entry was posted on Thursday, November 4th, 2010 at 6:35 pm and is filed under language, language history, lexicography, linguistics, usage, words. You can follow any responses to this entry through the RSS 2.0 feed. You can leave a response, or trackback from your own site. The ironic thing is that Webster’s Philip Gove – scourge of traditionalists, and seen by many as dangerously permissive – applied with unbending rigour a user-hostile lexicographic style which makes many of his dictionary’s definitions incomprehensible to anyone but another lexicographer. To quote Sidney Landau, he often ‘sacrificed intelligibility to a purity of style bordering on lunacy’. Meanwhile American Heritage – explicitly produced, as you say, to save the world from Webster’s enormities – employs a pleasingly straightforward and accessible style of definition. It’s also well worth noticing that NID2 was, in every way bar the status labels, an entirely descriptivist dictionary. If they didn’t print four-letter words, it was because they could have gotten into legal trouble for doing so. The notion that NID3 represented a revolutionary change in Merriam-Webster, or American, dictionary making is just false. Semi-OT: I note that RHD’97 is now online at infoplease.com, so all three American unabridged dictionaries are now available online without charge (but you do have to know how to get to NID3). I forgot to mention that the King’s English is a fixed expression in AmE, and is quite independent of which particular Guelf or Wettin or Wipper is sitting on the ancient Throne of Britain at the moment, and of whatever languages he or she may or may not speak. Thank you both for your insights. Michael, that is ironic indeed. I wonder what motivated his allegiance to a user-unfriendly style. My copy of the AHD is a mass-market paperback (4th ed. ); its clear presentation and physical ease of use are among the reasons I consult it so readily. John: That’s a good point about the potential legal difficulties. I should have thought of it. In what I wrote, I hoped to convey the significant departure W3 represented, but I wouldn’t call it a ‘revolutionary’ edition any more than you would. Thanks for enlightening me about the expression The King’s English. Given how politically loaded it is, it seems strange that it should have become fixed. John may be right that NID3 wasn’t as revolutionary as it was perceived to be, but the public outcry was real enough. A year later (1962) a whole book was published about the controversy NID3 created: James Sledd and Wilma R. Ebbit, editors. Dictionaries and That Dictionary. Chicago: Scott Foresman, 1962. Though the U.S. and the U.K. are indeed two countries divided by a common language, there are these odd survivals. Our one-cent coin has said ONE CENT on it since at least 1794, only a few years after the establishment of the Constitution in 1787, and yet we continue after more than two centuries to call the coins pennies (not pence) as well as cents. Money of account is always cents, however. The American use of the King’s English may be compared to an Italian way of saying “What, are you deaf?”, namely Parlò italiano o turco ottomano?, and remains so even though the Ottoman Empire fell more than 90 years ago. Obviously we are witnessing a bloody phenomenon: menstruation. Michael: Yes, I referred to that book, though I didn’t name it, in the fourth paragraph from the end: “an anthology about the controversy”. I’ll be keeping an eye out for it. language hat: Thanks for the quote by Landau, and for the link. Yours is an excellent post, with illuminating discussion; I’m sorry I neglected to include it, but I’m pleased you reminded me of it. John: Those are interesting examples, thank you. I still think the King’s English is a sexist (and strange) default setting. Sean: Unless I’m missing something, manland is that-a-way.